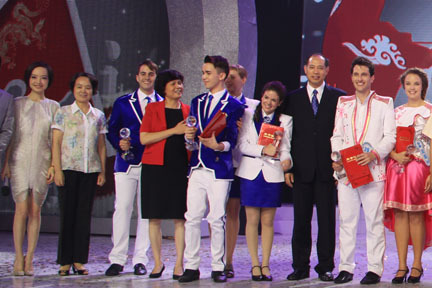 In the just-concluded finals of the 10th "Chinese Bridge" Chinese Proficiency Competition for Foreign College Students, British contestants became the biggest winners with a greatest online popularity prize, a first prize, two second prizes and a third prize for their outstanding performance. 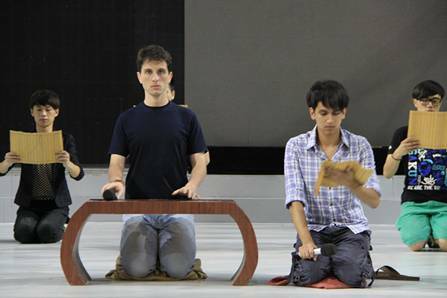 This new record-making achievement came after Stewart Johnson from SOAS won the 9th "Chinese Bridge" language competition last year and marked the sweeping victory of the British delegation in the contest in Changsha. Peter Dolby from the University of Edinburgh, James Bilbow and Alexander Odahara from SOAS as well as Adon Lawley from the University of Sheffield lived up to expectations by successfully reaching the top 30 in the competition with the 118 excellent contestants from around the world with their strong capacity and outstanding performances in the first round. They continued their strength in the following competition and Peter, James and Alexander made it to the top 12. After fierce competition, Peter Dolby, the "sunshine gentleman" from the University of Edinburgh, won the first prize with his vivid interpretation of the image of Confucius and great eloquence in debate, and was awarded by Hanban the Confucius Institute Scholarship for studying in China in degree programs (eligibility reserved for 3 years from 2012) and the round-trip international travel cost as well as the title of "Chinese Language Envoy"; James Bilbow and Alexander Odahara won the second prize and were awarded by Hanban the Confucius Institute Scholarship for studying Chinese in China for an academic year in 2012 and the round - trip international travel cost; and Adon Lawley won the third prize, awarded by Hanban the Confucius Institute Scholarship for studying Chinese in China for a semester in 2012 and the round-trip international travel cost. Meanwhile in the fierce battle for online popularity, Alexander achieved an overwhelming victory and received the "greatest online popularity" award as well as the Confucius Institute Scholarship for studying in China for one academic year. Peter and Adon respectively ranked the second and fourth.